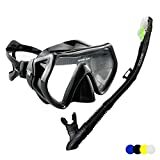 Full face snorkeling masks are definitely the way to go whether you are trying snorkeling for the fast time, getting your kids into it or if you want to experience the benefits of these compared to the traditional snorkel mask and goggles. In this review article we will cover both types but focus mainly on full face snorkel options. The traditional snorkel is the original tube design and it’s cheaper and less bulky than the full face snorkel. It’s also easy to clean and dry. Once you’ve got experience using them it is easy to ensure you get good lungfuls of air so you can do more strenuous swimming. Full face snorkels are more suited to more casual swimming, exploring and watching the natural world unfold on your days out. With a full face snorkel mask there is no learning curve, you need very little practice to breathe easily. Unlike traditional snorkels with a mouthpiece the full face version has no cumbersome – and sometimes uncomfortable – tube to grip in your mouth to get used to. In fact the gag reflex from holding the snorkel in your mouth can be unbearable for some. You have no such issues with the mask variety. The modern full face mask often has a valve set up on the snorkel itself to prevent water ingress that stops you from swallowing mouthfuls of the ocean. A common complaint leveled at goggles is their propensity for fogging up. 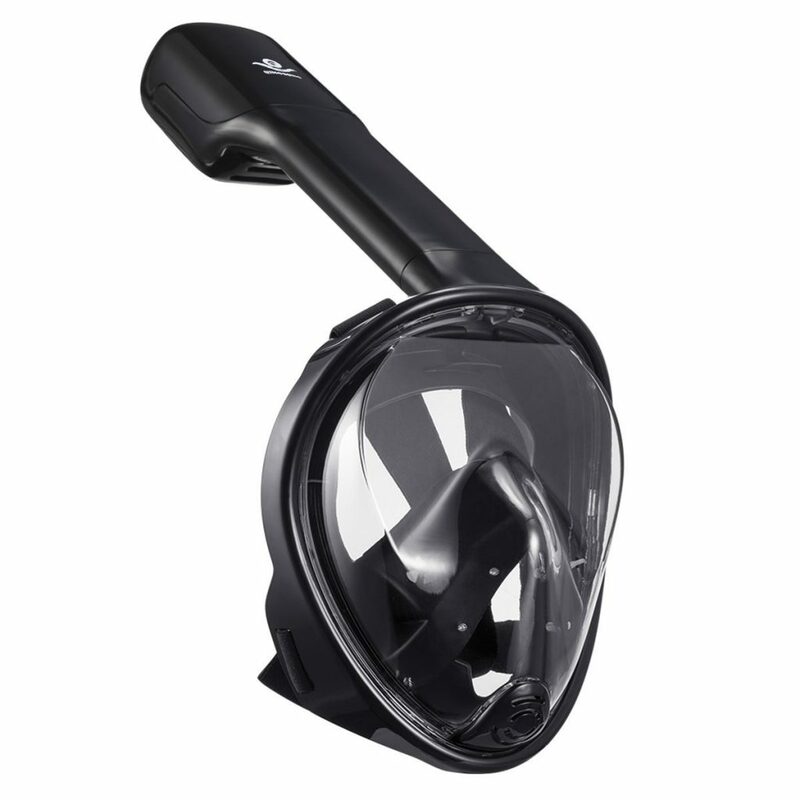 Due to the innovative air flow arrangement, fogging is rarely an issue with the full face snorkel. The majority of these have connectors for attaching your action camera and are often referred to as GoPro mounts. Finally, the full face snorkels have less restricted views than goggles and this, for many, is their main benefit. 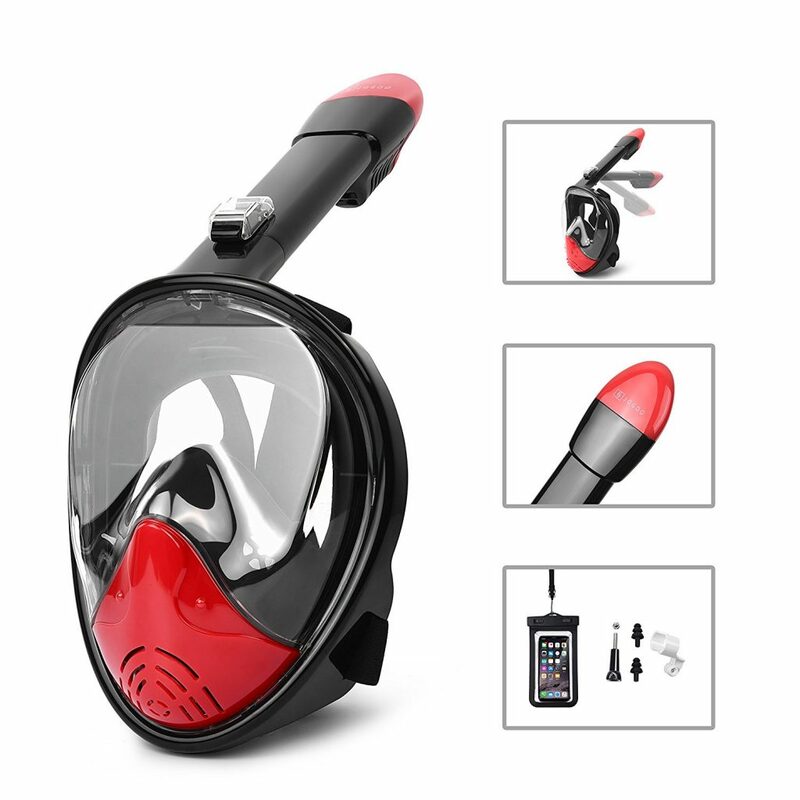 The downsides to the full face snorkel include how they trap a lot of air inside them which makes it difficult for you to submerge your head as easily and that if you have a beard you won’t get an airtight seal between your face and the skirt. The Wacool snorkel is a fresh spin on the traditional design. It comes complete with high quality goggles fitted with tempered glass lenses. If you have an accident these lenses will spiderweb rather than shatter for safety reasons. The goggles themselves have a silicone skirt which does a good job at preventing water ingress. They are also coated with anti-fog protection. The snorkel is moderately more comfortable than older types you may be used to. There is a built-in splash guard over the snorkel to reduce the chance of you having the unpleasant situation of breathing in salt water. It comes in four colors: blue, black, silver, and yellow/black. It also sports a version that you can mount an action camera to. It comes in a one-size-fits-most that is adjustable to fit the majority of face types. Starting us off is the awesome value Qingseng full face snorkel. This model comes in 12 color schemes; many are duo-colors that give you a very wide range with something for everyone. You could easily kit out your family with the Qingseng mask and never get them confused. The Qingseng snorkel is ideal for leisurely swimming and general exploring while on vacation. At this lower price point we were delighted by how comfortable this was to wear and we had no trouble with the interior fogging up. The small/medium size was a good fit for our (presumably) average faces. The Qingseng has a mount for a GoPro but we noticed that it does obscure the view slightly. This is a common issue with many full face snorkels however. Depending on the size you buy the Qingseng weighs between 1.23 lbs and 1.43 lbs. The food-grade silicone skirt feels really comfortable when you’ve tightened the elastic headbands. It didn’t irritate any of our reviewers’ skin and gave an excellent water seal even around the chin and forehead areas. You are prompted to soak your snorkel mask for around 10 minutes in warm water after swimming to clean it. 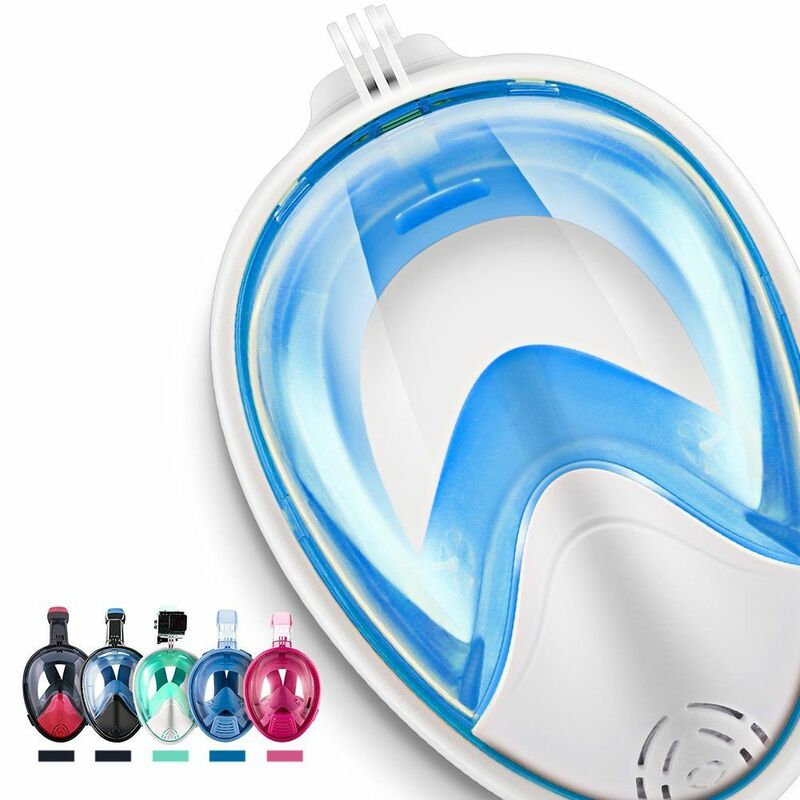 The transparent faceplate is made of plastic so it’s advisable not to smear it with any abrasive compound such as the divers’ trusted anti-fogging toothpaste! 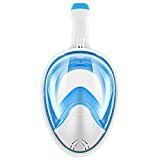 While the dual air-flow system prevents fogging, the toothpaste would leave scratches all over the inside. The package is completed with an accessories bag, a handy storage bag and a brief user manual. The accessories bag includes the removable camera mount, nut and wrench, and a pair of water-resistant earplugs. We have no hesitation in recommending this purse-friendly good all-rounder. 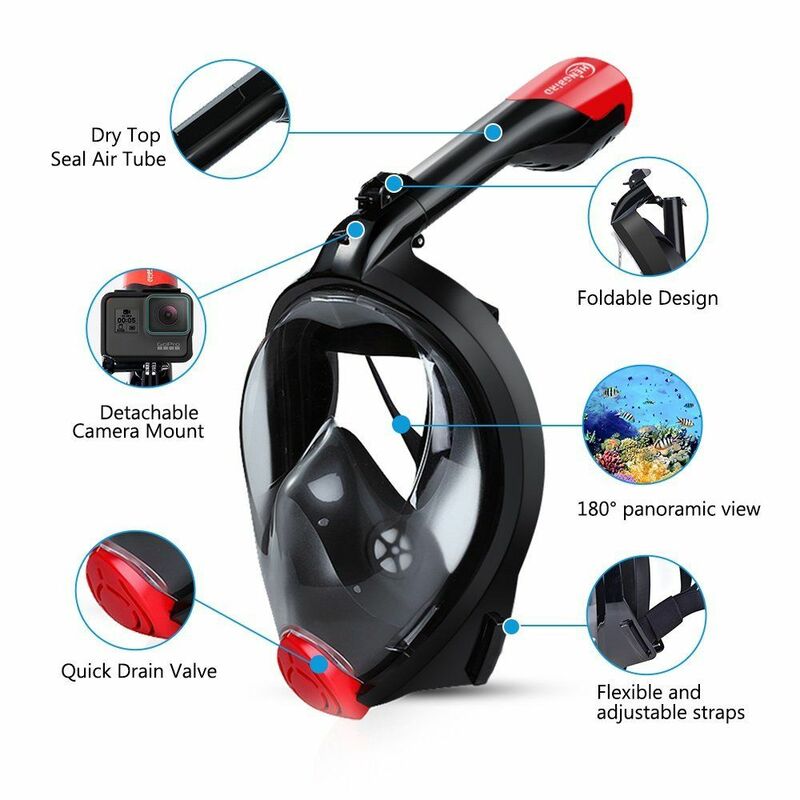 The Jogoo full face snorkel mask is also aimed at the budget market but still has a lot of features you would expect from higher priced offerings. It boasts the 180° viewing angle using a flat, wide-view lens which is surprisingly good at not causing eye-strain. It has a detachable GoPro camera mount. The material comprises food and medical grade PVC and silicone to ensure you have a safe wearing experience. The elasticated straps are easily adjustable and provide a good level of comfort too. It comes in five colors; black, light black, pink, blue and an aqua green but these refer to the tint on the plastic window plate. The body of the mask is either a gloss black or white and – in the case of the black masks, they have a red mouth shield. It comes in two sizes (small/medium and large/extra large) that fit most children and adults. In terms of the experience it’s pretty good – the substantial, flat fronted mask provides an exceptionally large window on the underwater world. The marketing proclaims that you won’t suffer from eye-strain with their 180° viewing angle and from our experience we would agree! The Jogoo boasts ‘Dry Snorkel Technology’ which means that you won’t suddenly find yourself inhaling water if your snorkel gets submerged. While we’re discussing the breathing tube we noticed that it’s slightly longer than some of its competitors’ allowing you a little extra flexibility when peering beneath the surface. When not in use, the breathing tube folds away neatly for ease of packing and portability. Getting used to breathing while wearing this snorkel is simple regardless of whether you breathe through your mouth or nose. The internal airways prevent fogging and work well as long as you don’t overexert yourself. The Jogoo comes with a carry bag and a waterproof pouch to protect your mobile phone. A 30-day full refund guarantee is offered for your peace of mind; just remember to test it out shortly after receiving it to make sure you qualify should you not be totally happy with it. 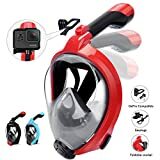 Jogoo 180° View Snorkel Mask,Full Face and Anti-Fog Anti-Leak Design for Snorkeling,GoPro Compatible,Longer Snorkeling Tube,See More with Larger Viewing Area Than Traditional Masks. The Hengbird mask is the upgraded model for 2018 and has made improvements on their previous full face snorkel mask. The snorkel tube simply push-locks into place. The GoPro camera mount is detachable, giving you the freedom to leave your action camera behind and not have the unnecessary bulk or weight of the mount to encumber you. The flat lens window does a superb job of giving you an almost panoramic view of the underwater realm without distortion. It comes in two colors, a black with red trim, and a blue with black trim. The Hengbird caters for children and adults with its small/medium and large/extra large sizes. 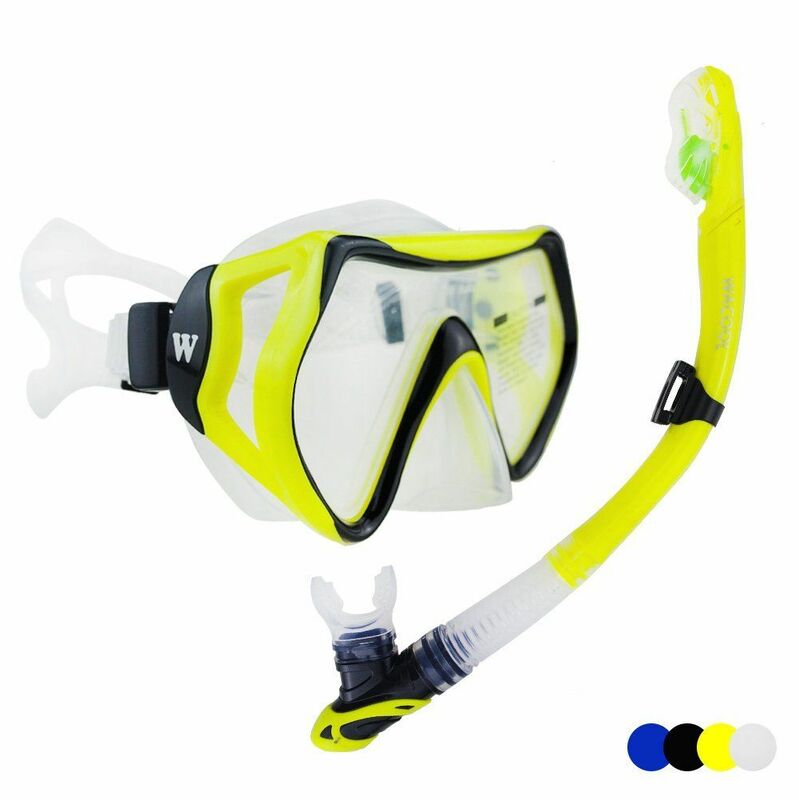 The full face snorkel molds itself well to the contours of your face and maintains its comfort throughout all but the longest surface snorkeling trips. Breathing in through your nose and out through your mouth becomes second nature very quickly and you get the reassurance that no water can make its way into your mask through the snorkel tube. The accessories include the ubiquitous user manual, camera mount and screw, the useful detachable earplugs and a mesh bag for transporting your kit around. At a slightly higher price point the X-Lounger doesn’t disappoint both in terms of its design and its quality. New for 2018 this model comprises a generous 180° viewing angle and a UV-resistant coated window. This full-face snorkel has a longer tube and it folds inside the mask when not in use for convenient storage. A small ball within the tube makes it airtight to stop water ingress down and into your mouth. You do get a good airtight seal with this mask but if you have a lot of facial hair it will leak. The X-Lounger comes in an adult-only size of large/extra large. Design-wise this mask is available in a gloss black or white finish with a choice of window tints (black, clear, blue or pink). It is a breeze to breathe while wearing this but the usual caveats of not overexerting yourself or diving still apply. Other features include a detachable GoPro mount that is positioned so as not to restrict your visibility while also being at a good angle to catch everything you are seeing. It also features an extender for those trickier views. We love the buckle design on the mask straps; it makes it easy to adjust for best fit without you having to take it off. The body of the mask is frosted to reduce the risk of unsightly scratches. The X-Lounger package comes with an airing mesh bag and a nylon bag. Accessories include useful waterproof earplugs (that can be detached should you wish). Our last full face snorkel on test is this impressive mask from BFULL. This is BFULL’s exceptional upgraded model for 2018. It comes in two popular sizes, the small/medium and large/extra large. The BFULL is available in four duo-color schemes: black/red, black/blue, white/blue, white/green and two single-color schemes: all pink and all blue. Unlike most of its competitors the plastic viewing lens is only slightly tinted so as to preserve the real-life colors of marine life. Visibility-wise, the lens is remarkably clear and you definitely appreciate the full viewing angle you get from this mask. Out of all the masks on test, the BFULL is arguably the most comfortable to wear for protracted periods of time. The elastic silicone and stretchy straps ensure you get the most out of your swimming experience. They’ve made improvements to the airways which mean that it’s easier to take deeper breaths. As a tip to correct fitting, it’s advisable to make sure there is a firm seal between your chin and the bottom of the mask as this is where it’s most common to find a leak. The full face snorkel is a large design that benefits your visibility but also means that there is a large volume of air trapped within it. This makes your head rather buoyant and, if you are not used to these types of snorkels, may make your neck sore at the end of the day. BFULL offers a no questions asked 30 day money back guarantee if you are not completely happy with their product. This certainly gives us confidence in purchasing this mask. We also think their build quality is among the best, there is a one year guarantee on this too. As expected the BFULL is made with premium-grade silicone so as to be non-toxic, nitrosamine-free and safe to be on your skin. For safety, the snorkel tube won’t let water down into your mouth. This mask has an action camera mount for those moments when you want to record your memories of the sights above and below the surface. The package includes a mesh bag that allows your mask to dry after a session but it’s recommended that you give your mask a thorough rinse with warm water before storage. The BFULL full face snorkel mask gets our vote as a recommended buy for your vacations and trips. 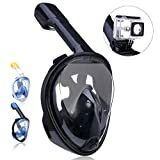 Integrated Camera Mount design, you can easily attach your action camera to capture every amazing moment in the sea and share your wonderful adventure with your family and friends. We have selected some of the best full face snorkel masks that meet – and often surpass – our expectations. For a reasonable price you can get outstanding value for money and a much better user experience than with a traditional, regular snorkel.